Mark Cuban has purchased a principal ownership stake in the Professional Futsal League (PFL). 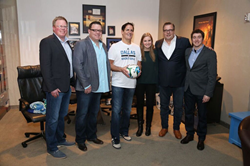 Mark Cuban has purchased a principal ownership stake in the Professional Futsal League. The PFL’s decision to partner with Cuban illustrates the league’s commitment to provide fans, communities, and partners with the highest quality sports and entertainment experience. Cuban is an American businessman, investor, film producer, author, television personality and philanthropist. He is the owner of the NBA's Dallas Mavericks, Landmark Theatres, and Magnolia Pictures, and the chairman of the HDTV cable network AXS TV. He is perhaps most famous for his position as "shark" investor on the ABC television series Shark Tank. As FIFA's only officially approved version of 5-a-side soccer, futsal is currently played in 198 of the 207 FIFA member associations across the globe with an estimated 30 million participants playing worldwide. It is currently supported by professional leagues on every continent except North America. Almost every global soccer star from Pelé to Leo Messi has credited futsal for being vital to their development. Many global powers including FC Barcelona from Spain’s La Liga already feature professional futsal teams in addition to their renowned soccer programs. The Professional Futsal League will begin play in 2017. For information about the PFL and franchise ownership opportunities, visit professionalfutsal.com.